Bob Gray: Hello. 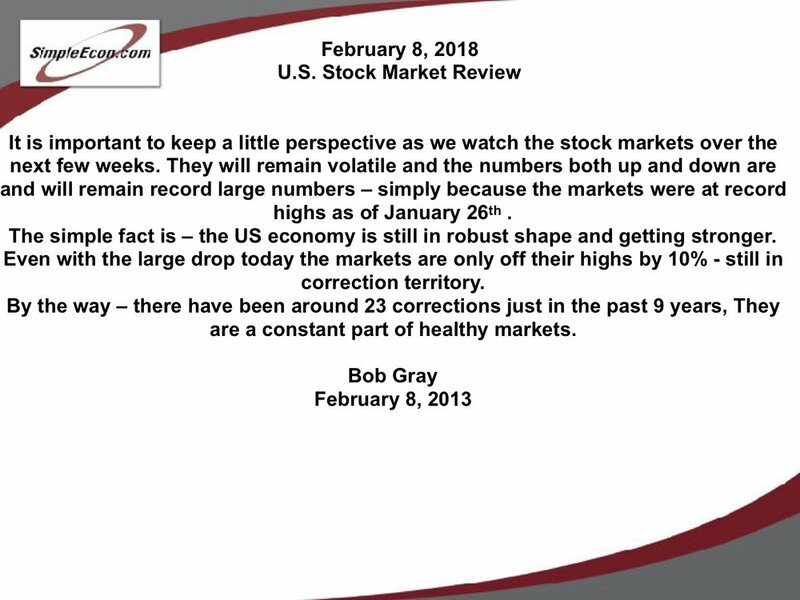 This is Bob Gray for Simple Econ, and I'd like to talk a little bit about the question of the day, is the stock market falling or is it correcting? My opinion, and I feel pretty strongly about this that it is just a good old-fashioned correction. There's several reasons why this is going on. Probably, the first being just time to take some profits and maybe look at your rotation in and out of certain segments of the market, because it's been a long time, probably 14 months or so, since we've had any kind of a pullback or correction. Corrections actually are a sign of strength. The market's just doing a little cleansing before they continue to move up. I do not think we're in an all-out fall, because it's very simple, and I'm going to go through the reasons why over the next few slides. So bear with me and let's move on. Obviously, we all know what's happened over the last few days. The Dow has dropped. So has the S&P, the Nasdaq, and even the broader market of some 8,000 stocks, and it's even starting to take some of the other countries with us, because as the US economy goes, so does the rest of the world's economy generally. But as you can see there below, there are 50-day averages, which is the blue line that goes across them, but the 200-day moving averages are still well above. And my feeling is that they will start to look for a bottom here soon and start turning back up. However, it's not going to be a shot right back up like we've just experienced. The volatility has increased dramatically, obviously, over the last three days, and I expect to see the volatility remain with us, albeit not quite this volatile, but the market should continue to start to move back up and probably end up with a fairly decent year somewhere in the seven to 10% increase in the markets. The biggest issue though is concern over whether the Fed will increase the interest rates too many times this year or too fast, which could slow economic growth, and they're afraid it'll affect the profits of other companies, too, because they have to pay more for the money they borrow. But the Fed's been very honest and open over this process. They say they're going to raise it two to four times this year. They're probably going to raise it here in about six weeks their first one for the year, because pretty much everything that's going on in the US economy indicates the rates should go up, and it would be a positive thing because it indicates further strength in the economy and further expected growth in the economy. Like I said, the next one will possibly come in about ... The first one for the year will come in about six weeks, which will only take us up to about 1.75%. By the end of the year, we should all probably be somewhere around 2.5% interest rates, which is still not a high interest rate. The key thing that generally people fear when the interest rates start going up is a reduction of liquidity in the system, as the Fed starts to pay back the money they've printed over the years. But right now, as you can see, excess bank reserves on deposit at the Federal Reserve Bank are still over $2 trillion as of the end of January. So that's a substantial amount of money, and that money is ready here to be lent out, whenever the banks feel ready to start lending again at a faster rate. The banks currently earn interest on this money while it sits at the Federal Reserve, and they're earning, like, right now, 1.5%. So, they're really not in a rush to lend it out. And as rates rise, it obviously becomes more advantageous and profitable for banks to start loaning the money. Right now, the earnings, which is the key reason why we buy stocks and is to share in the earnings and growth of the companies of the stocks we buy. And as of today or as of last Friday, 50% of the S&P 500 stocks have reported their actual results for the fourth quarter of 2017. 75% so far have reported actual earnings per share above what was estimated, and their blendings earning growth rate is at 13.5%, and earnings for all of 2018 are expected to grow in double digits, partially because of the income tax reform, but also because of sales. And 80%, which is a very high number, are reporting actual sales above estimates, and we haven't seen a strong sales growth in, well, actually, since the beginning of the Great Recession. So this is a very positive sign overall for the economy and the markets. The blended sales growth right now is at 7.5%, and if that continues, that will be a very, very strong reporting season. And like I said earlier, the share growth or earnings per share are actually expected to continue to rise to the fourth quarter of 2018, and it shows a little decline in the first quarter of 19, which is, generally, the first quarters are a little lighter, but we do not expect the first quarter of 28 or 2018 to be light. We expect a continued growth there. Good economic news continues. The Purchasing Managers Index, which is probably the most reliable index of what's going on in manufacturing in the United States. It's at currently at 59.1%. The key ones though are the Production and the New Orders Index, which are up in the mid-60s, which are very, very strong numbers. Employment Index continues at 54.2%. And remember, any number above 50 indicates growth, so the higher it goes over 50, actually, the more growth we can expect. And then the service industry or the Non-Manufacturing Index from the same organization, the Institute of Supply Management, is at 59.9%, which is the highest reading since 2005. And again, you look at the business activity in the New Orders', very, very strong, as is the Employment Index in the service industry. And again, all numbers above 50 indicate growth. If you look at personal income in the united states, total earnings are up 4.3%, which is a very, very strong number, and average hourly earnings for the last 12 months are up 2.9%, which is the largest 12-month increase since just prior to the start of the Great Recession. There's also plenty of other positives for America. The Home Builder's Index is that a 72, which is just off an 18-year high, which was a month or two ago. Auto sales continue to be strong in the United States, although expected, since a lot of people have bought new cars over the last few years, to start to slow down a little bit, but they're still going at a very strong pace. And the Fed's Index of Industrial Production is up 2.3% in 2017, and December's production was the highest in 10 years, all very positive signs for the economy. And because of that, you can see the GDP now, which is a forecasting program put together by the Federal Reserve Bank of Atlanta, and it's showing first quarter 2018 gross domestic product through February first of 2018 growing at a 5.4% rate. Now, no one expects that to continue, but it does look like we could end up with a 3.5 to 4% growth rate in the first quarter of 2018, which is extremely strong, and would give us a four straight quarters of very, very strong growth in our US economy. And with that, the stock market should continue to go up, as profits go up, and as sales go up. Everything's looking good in the economy and all these give every reason to believe that this is nothing but a little slight correction, and things will start be moving forward. Thank you very much, and I will be back the next time I think there's a major change in the market forecast.